1768-1830. He was born at Gosport, Hampshire, the third son of Captain William Anthony Halsted, and of his wife Mary Frankland. He was the brother of Lieutenant Charles Halsted who died when the Blanche 32, Captain Samuel Uppleby, was lost with all hands in the ‘Great Hurricanes’ of October 1780, of Vice-Admiral Sir Lawrence William Halsted, and of Commander George Halsted. John Halsted joined the Navy in 1776 aboard the Jersey 60, commanded by his father, which vessel went out to North America in May of that year. Following his father’s death at New York in 1778 he joined the Amazon 32, Captain Maximilian Jacobs, which returned to England and went around to the Nore to be paid off in February 1779. He spent the next three years at school before joining the Blenheim 98, Captain Adam Duncan, in the Channel Fleet during 1782, in which he was present at the Relief of Gibraltar on 18 October and the subsequent engagement with the Spanish fleet off Cape Spartel. Halsted saw further service with the Princess Royal 98, Captain Jonathon Faulknor, when she became a guardship at Portsmouth following the end of hostilities, removing during 1783 to the Queen 98, Captain John Wainwright, the flagship at Portsmouth of Admiral John Montagu. Shortly afterwards he joined the Ganges 74, initially commanded by Captain Hon, James Luttrell, and after that officer had retired ashore through ill health during 1783-4 by Captain Sir Roger Curtis. He later found employment in home waters aboard the Hebe 36, Captain Edward Thornbrough, which frigate was paid off in 1785. In February 1789 Halsted went out to India with the Cornwallis Expedition aboard the Perseverance 36, Captain Isaac Smith, and he saw further duty with the Crown 64, carrying the broad pennant of Commodore Hon. William Cornwallis, prior to returning home in 1792 aboard that vessel under the command of Captain Robert Manners Sutton. With war against France looming Halsted joined the Portsmouth guardship Brunswick 74, Captain Sir Roger Curtis, whom he followed to the Queen Charlotte 100, Captain Hugh Cloberry Christian, when Curtis was appointed captain of the Channel Fleet to Admiral Lord Howe. On 20 September 1793 Halsted was commissioned lieutenant of the Suffolk 74, Captain Peter Rainier, and he went out with that officer, who had been promoted commodore and commander-in-chief, to the East Indies in April of the following year. Here he participated in the reduction of Trincomale on 26 August, and during February – March 1796 served at the capture of Amboyna and Banda Neira, the present day Moluccan Islands. In 1797 he assumed the acting command of the sloop Swift, but shortly afterwards he was placed in command of the newly-established Naval Hospital at Madras, Rainier having been impressed by his care of the sick during the Amboyna campaign. Halsted was next appointed to the recently purchased bomb Vulcan at Calcutta in July 1797, which it was intended would join an expedition to Manila, although in the event this was abandoned. In November he was appointed to the frigate Heroine 32, but was then asked to exchange with Captain Hon. John Murray who was commanding the Crescent 36 at the Cape in order that Murray could attend to personal affairs in India. Unfortunately, by the time Halsted reached the Cape the Crescent had departed for England under the command of Captain Charles Brisbane with the homeward-bound flag of Rear-Admiral Thomas Pringle. He was therefore left to proceed to England under his own means with Admiral Rainier’s despatches, but upon arrival in June 1798 suffered a further disappointment when the Admiralty refused to ratify his posting to captain and instead merely confirmed his promotion to commander with seniority from 22 June 1798. In December 1804, after six years of unemployment, Halsted was given the command of the defence ship Lord Nelson in the Downs, and in 1807 he was appointed the principle agent of transports attached to the expedition that forced the surrender of Copenhagen on 7 September. Again he was unfortunate in so much that the captain of the fleet, Home Riggs Popham, failed to mention his contribution, and only after going out to Gibraltar and assisting with operations in Portugal was he posted captain on 21 November 1808. He nevertheless remained with the Transport Board into the following year. In November 1810 he returned to active employment in command of the Bellerophon 74, fitting her out for the flag of Rear-Admiral John Ferrier who then led the blockade off the Texel and the Scheldt in 1811-12. Halsted brought the Bellerophon back to Portsmouth in December 1812 where she was docked in order to fit out for the flag of Vice-Admiral Sir Richard Keats, the commander-in-chief designate for Newfoundland. 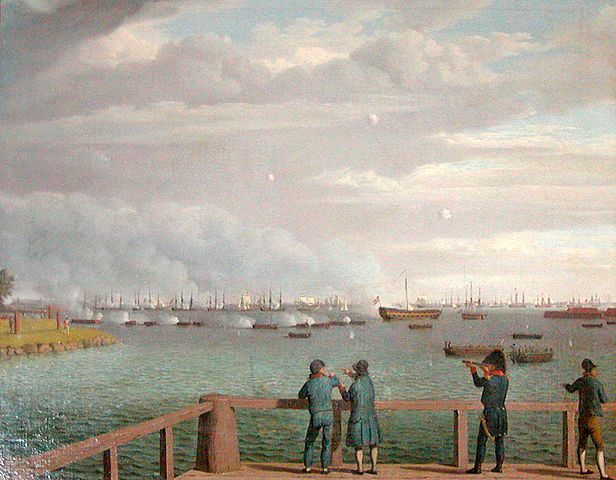 After commissioning the Scarborough 74 in February 1813 Halsted rejoined Ferrier whose flag he flew off the Scheldt, retaining this vessel through to the beginning of the following year. 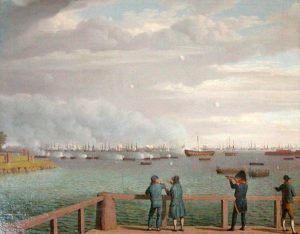 His final employment in the Napoleonic War was with the Impress Service at Gosport. Captain Halsted died on 2 November 1830 at Exeter, Devon. He married Ann Fowler in 1798 and had a daughter and two sons, Lawrence William Halsted, who entered the Army, and George Anthony who became a captain in the Navy. The address in his will was given as Lyme Regis, Dorset.